Vinelea is a small vineyard and winery, owned and managed by Stuart Smith & Rhonda Parish, a couple who studied science and worked in Melbourne in various technical and professional roles before moving to Beechworth in country Victoria for a life more in tune with the seasons. We are passionate about conservation, and the health of our land and the vineyard in particular. The care and attention taken to all vineyard work and winemaking results in high quality, intensely flavoured wine. We produce very small quantities of three wines, about 120 cases of each, the style of all three being influenced by classic French wines. Each is designed to be appealing in youth, as well as promising an exciting old age. Our Shiraz is concentrated and full bodied with fine tannins, and offers scents of raspberry, blackberry, earth, spice, black cherry, bacon, olives and pepper. The Chardonnay is in the traditional full bodied Beechworth style, and displays good body and depth of lemon/lime fruit flavours that will mellow and become rounder and deeper with age. The ‘petit blanc’, a blend of the classic Rhone varieties of Marsanne & Roussanne, is a white wine with superlative body and texture but still exhibits honey and pear flavours which intensify with age. All of our grapes are sourced from our own Malakoff Road vineyard, and the wine is made and bottled by ourselves on the property. Our vineyard, established in 2006, is 3km NW of Beechworth township and sits in a horseshoe bend of Graveyard Creek, with a ridge line at 400m above sea level, and gentle sloping faces to both the north and south. The north aspect is noticeably warmer and ideal for Shiraz, while the south is cooler, more protected and better suited to the Chardonnay, Roussanne and Marsanne plantings. The soil is the highly-regarded decomposed buckshot gravel over clay. We bring a scientific approach to vineyard management, in that we observe and act where required and no more. We are extremely conservative with vineyard sprays using only the traditional Copper and Sulphur sprays to prevent mildew, and other simple chemicals only where absolutely necessary. Vineyard planting is at 1000 vines per acre and we rigorously shoot and fruit thin to ensure that each vine is only carrying the crop it can ripen, and adjust these levels based on the weather each year. We are focused on long term vineyard health, and that includes biodiversity and caring for the soil, so we are essentially following organic principles, with a strong focus on composting and ploughing to open the soil to moisture and air penetration. Our wine making philosophy is highly influenced by traditional French practices, including minimal intervention, clean healthy fruit, yeast from the vineyard, the best French oak that we can afford, long, slow maturation, minimal fining & filtering of the white wines and none for the reds. 2017 Vinelea "Malakoff" Syrah was produced from 100% estate-grown fruit, hand-picked, fermented in small parcels with some whole bunches included, basket-pressed and aged for 24 months in 40% new tight-grain French oak barrels, with no fining or filtering. This is a return to the weight, texture and complex flavours of the 2013 vintage, with saturated purple to black colour, the aroma of blackberries, plums, smoky bacon and spices. This is a serious wine without being too heavy or cloying. The flavours are of black cherries, blackberries and liqourice, in an extremely rich palate with robust mouthfeel and great length. A wine that will age well over the next 5 to 10 years. Under cork (Diam). 2017 Vinelea Chardonnay - All fruit from our own vines, hand picked, crushed and pressed in the cool of the morning, barrel fermented cool, lees stirred, 100% malo fermented, no filtration, bottled now using Diam cork. An excellent follow up to the 2016 vintages, again a very full bodied wine with a touch of new oak, lots of fresh chardonnay fruit, initially with lemon/lime at the front of the palate but then developing into a rich, silken mouthful of wine with great length and a beautiful finish. Huon Hooke says "Medium to full yellow colour, seemingly forward developed, with a voluminous, forward-matured bouquet of butterscotch, dried apricots, toasty vanillan oak and buttery malolactic characters. The wine is full-bodied, rounded and ample, with chewy tannins and a hint of bitterness, all combining to give an emphatic, resonant finish. It's very forward. An idiosyncratic style, and very appealing. Drink now–2023 "
2016 petit-blanc - a 50/50 Marsanne/Roussanne blend, picking and processing as per the chardonnay was applied here, with the exception of tank fermentation then 18 months barrel aging and 12 months in bottle prior to release. The wine has real body for a white wine, a generous floral nose, strong acid backbone and great length. It's not a fruit driven wine, but has a mellowness and honeydew mid palate that really carries the wine, with just a touch of spice, making it an absolute pleasure to drink. It is listed in some of Australia's best restaurants. Huon Hooke says "Light to mid-yellow colour. The nose is buttery-toasty and mellow, showing a little maturity. A trace of honey. There is fullness, richness and amplitude, thanks partly to the age development. Full-bodied and ample, it fills the entire mouth with flavour and the mellowness and generosity plus the complex range of flavours make it utterly lovely to drink. Drink now–2022 "
2018 Pinot Noir - every now and then in life, it's time to take a risk, and back in 2012 we decided to take a chance and plant 6 rows of Pinot Noir between the 2 major vineyards. The site was great for Pinot, not too warm, protected from the North and West, and some of the better soil in our home block. 6 years later, the vines were mature enough to take our first harvest, and get a feel for what the variety could produce on our soil. The grapes was destemmed & crushed, chilled to slow the onset of fermentation, then left to soak for a few days before nature took its course. After pressing the wine was racked to an excellent, near new Caven barrel for elevage, racked once, and then bottled 10 months later. So, how did it come out? Very well indeed, the wine has excellent depth of dark pink to red colour, a heady nose with sour cherry and oak notes, and the palate is generous, rich, but not overpowering. Tannins are in balance, and there is primary fruit character on show. Only 1 barrel produced, so 25 dozen bottles, so get in quickly if you'd like to try it. If you'd like to visit: please call 0427 928 511 or email winery@vinelea.com.au to arrange a time. 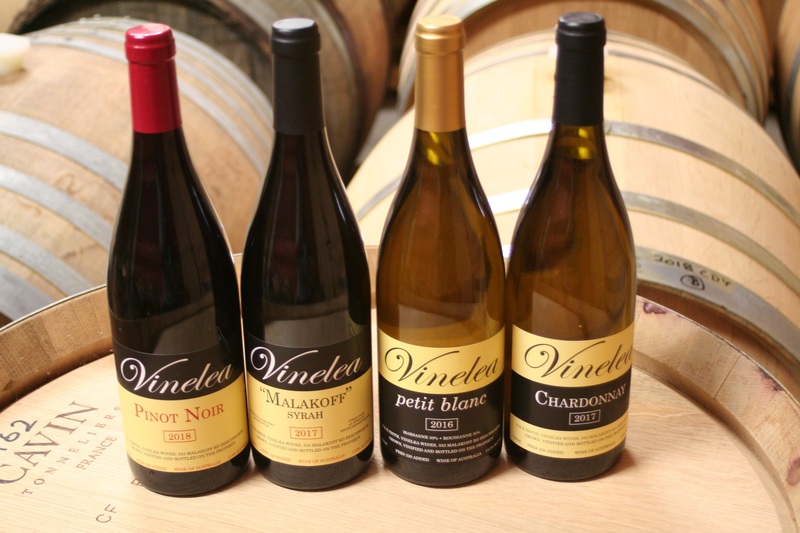 Where can you buy Vinelea Wines? Like us on Facebook, or just have a look at some pictures from Vinelea.